Philadelphia, Pa., Oct. 24, 2009 – Born with a retinal disease that made him legally blind, and would eventually leave him totally sightless, the nine-year-old boy used to sit in the back of the classroom, relying on the large print on an electronic screen and assisted by teacher aides. Now, after a single injection of genes that produce light-sensitive pigments in the back of his eye, he sits in front with classmates and participates in class without extra help. In the playground, he joins his classmates in playing his first game of softball. His treatment represents the next step toward medical science's goal of using gene therapy to cure disease. Extending a preliminary study published last year on three young adults, the full study reports successful, sustained results that showed notable improvement in children with congenital blindness. 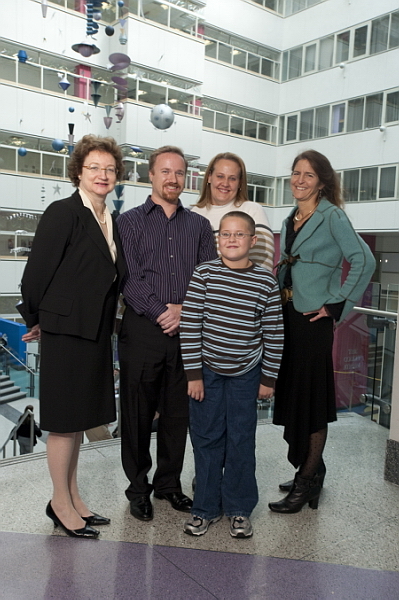 The study, conducted by researchers from the University of Pennsylvania School of Medicine and the Center for Cellular and Molecular Therapeutics at The Children's Hospital of Philadelphia, used gene therapy to safely improve vision in five children and seven adults with Leber's congenital amaurosis (LCA). The greatest improvements occurred in the children, all of whom are now able to navigate a low-light obstacle course—one result that the researchers call "spectacular." "This result is an exciting one for the entire field of gene therapy," said Katherine A. High, M.D., co-first author of the study and the director of the Center for Cellular and Molecular Therapeutics, the facility that sponsored the clinical trial at The Children's Hospital of Philadelphia. High, an investigator of the Howard Hughes Medical Institute and a past president of the American Society of Gene Therapy, has been a pioneer in translational and clinical studies of gene therapy for genetic disease. "This study reports dramatic results in restoring vision to patients who previously had no options for treatment," said High. "These findings may expedite development of gene therapy for more common retinal diseases, such as age-related macular degeneration." Although the patients did not attain normal eyesight, half of them (six of 12) improved enough that they may no longer be classified as legally blind. "The clinical benefits have persisted for nearly two years since the first subjects were treated with injections of therapeutic genes into their retinas," said senior author Jean Bennett, M.D., Ph.D., F.M. Kirby professor of Ophthalmology at the University of Pennsylvania School of Medicine. For Bennett, the results build on nearly 20 years of gene studies on hereditary blindness, starting with pioneering work in mice and dogs. "These remarkable results," she added, "have laid a foundation for applying gene therapy not only to other forms of childhood-onset retinal disease, but also to more common retinal degenerations." The study team reported their findings today in an online article in The Lancet. "Children who were treated with gene therapy are now able to walk and play just like any normally sighted child," said co-first author Albert M. Maguire, M.D., an associate professor of Ophthalmology at Penn and a physician at Children's Hospital. "They can also carry out classroom activities without visual aids." Maguire and Bennett have been researching inherited retinal degenerations for nearly 20 years. Leber's congenital amaurosis, the target of this current study, is a group of inherited blinding diseases that damages light receptors in the retina. It usually begins stealing sight in early childhood and causes total blindness during a patient's twenties or thirties. Currently, there is no treatment for LCA. Walking along a dimly lit, simulated street route, the children were able to negotiate barriers they bumped into before the surgery. Another child, who since birth, could only see light and shadows, stared into his father's face and said he could see the color of his eyes. Later they played soccer together. Researchers from the University of Pennsylvania School of Medicine and the Center for Cellular and Molecular Therapeutics at the Children's Hospital of Philadelphia have used gene therapy to safely improve vision in five children and seven adults with a rare form of congenital blindness. Albert M. Maguire, M.D., associate professor of Ophthalmology at Penn and a physician at the Children's Hospital of Philadelphia; Katherine High, M.D., director of the Center for Cellular and Molecular Therapeutics at the Children's Hospital of Philadelphia; Investigator, Howard Hughes Medical Institute and Jean Bennett, M.D., Ph.D., professor of ophthalmology, at Penn are co-authors of the reversal of blindness in children study published in the Lancet. The gene therapy vector (shown) used in the study was manufactured at the Center for Cellular and Molecular Therapeutics at the Children's Hospital of Philadelphia. For children and adults in the study, functional improvements in vision followed single injections of genes that produced proteins to make light receptors work in their retinas. The 12 subjects ranged in age from 8 to 44 years old at the time of treatment. Four of the children, aged 8 to 11, are the world's youngest individuals to receive gene therapy for a non-lethal disease (A fifth subject was 17 years old). On the other end of the age scale, the 35-year-old man and 44-year-old woman are the oldest patients to ever receive gene therapy for retinal degeneration. For the current human trial, the research team used a vector, a genetically engineered adeno-associated virus, to carry a normal version of the gene, called RPE65, that is mutated in one form of LCA, called LCA2, that accounts for 8 to 16 percent of all LCA cases. Jeannette Bennicelli, Ph.D., in Bennett's laboratory, cloned the gene. The clinical vector production facility at Children's Hospital's Center for Cellular and Molecular Therapeutics (CCMT), directed by Fraser Wright, Ph.D., manufactured the vector. The clinical trial brought together subjects and scientists from two continents. Five patients enrolled in the study were identified at the Department of Ophthalmology at the Second University of Naples, an institution with a long-standing program in researching inherited retinal diseases, under the supervision of Francesca Simonelli, M.D. Two children from Belgium were recruited through Ghent University Hospital, under the supervision of Bart Leroy, M.D., Ph.D. Jennifer Wellman, of the CCMT, directed all local and federal regulatory interactions for the study. Another co-author, Edwin Stone, M.D., Ph.D., Howard Hughes Medical Institute Investigator and director of the Carver Center, a genetic testing laboratory at the University of Iowa, identified and verified several of the disease-causing mutations in the study subjects. In April 2008, the current study team published encouraging preliminary results in the New England Journal of Medicine regarding three young adults, the first to receive gene therapy in this current clinical trial. Those subjects showed improvements in their visual function in both objective vision tests and subjective reports by the patients themselves. Patients who could only detect hand movements gained the ability to read lines on an eye chart. After the first group of three young adults was treated safely, the study team extended gene therapy to five children from the United States, Italy and Belgium, in addition to four other adults. Because animal studies conducted by Bennett and colleagues had shown that visual improvement was age-dependent, the researchers tested the hypothesis that younger human subjects would receive greater benefits from the treatment. "LCA is a progressive disease, so if a treatment was possible, it was plausible to intervene before damage to the retina was severe," said Bennett. In all, 12 patients received the gene therapy via a surgical procedure performed by Maguire starting in October 2007 at The Children's Hospital of Philadelphia. For each subject, Maguire injected the therapeutic genes into the eye with poorer function. There were three patient cohorts, receiving low, middle and high doses. No serious adverse events occurred in any of the test subjects. Starting two weeks after the injections, all 12 subjects reported improved vision in dimly lit environments in the injected eye. An objective measurement, which measures how the eye's pupil constricts, showed that all the subjects were able to detect significantly more light after treatment and also showed greater light sensitivity in each patient's treated eye compared to the untreated eye. In addition, before treatment, nine patients had nystagmus, an involuntary movement of the eyes that is common in LCA. After treatment, seven of them had significant improvements in nystagmus. Some of the most dramatic results, captured on video by the researchers, are apparent as subjects traverse a standardized obstacle course. Before the treatment, the patients had great difficulty avoiding barriers, especially in dim light. After treatment, the children navigated the course more quickly, with fewer errors than before, even at the lowest light levels. Not all the adults performed better on the mobility course, and for those who did, the improvements were more modest compared to the children's. "In follow-up studies, we will continue to monitor these patients to determine whether this treatment stops the progression of this retinal degeneration," said Maguire. "In the future, we hope to investigate whether other	retinal disease will be amenable to this gene therapy approach."